Both the NYC Mansion Tax for buyers and the NYS Transfer Tax rates for sellers were increased in April 2019 as a result of tax law changes enacted as part of the New York State 2020 Fiscal Year Budget. There were no changes made to the NYC Transfer Tax rates as part of this legislation. The original Mansion Tax in effect from 1989 to mid-2019 was a fixed 1% of the purchase price for all residential sales of $1 million or more. The new Mansion Tax enacted in April 2019 consists of 8 tax brackets ranging from 1% to 3.9%. The lowest rate of 1% applies to sales from $1 million and below $2 million. The highest rate of 3.9% applies to sales of $25 million or more. The NYS Transfer Tax was previously a fixed 0.4% of the sale price. As part of the 2019 update, a higher tax bracket of 0.65% was created for sale prices of $3 million or more. The higher 0.65% tax bracket was also adopted for commercial transactions, however it kicks in starting at $2 million as opposed to higher $3 million threshold for residential deals. You can estimate your Mansion Tax and Transfer Tax bills using Hauseit’s interactive Mansion Tax Calculator for Buyers and Transfer Tax Calculator for Sellers. What Changes Were Made to the NYC Mansion Tax in 2019? What Are the Updated NYC Mansion Tax Rates for NYC? What Changes Were Made to the NYS Transfer Tax in 2019? What Are the Revised NYS Transfer Tax Rates Effective in 2019? What Changes Were Made to the NYC Transfer Tax Rates in 2019? The Mansion Tax was changed from being a fixed 1% on all sales of $1 million or more to a progressive, 8 tax bracket system with the highest tax rate of 3.9% applying to sales of $25 million or more. The original 1% Mansion Tax bracket is still applicable to sales of $1 million or more and below $2 million. It’s important to note that the designated Mansion Tax rate for each purchase price bracket applies to the full purchase price of the property. For example, the 1.25% rate on purchases of $2 million and below $3 million applies to the full purchase price. If the purchase price is $3 million, the Mansion Tax would be 1.25% of $3 million, or $37,500. Technically speaking, the modification to New York Tax Law kept the original 1% Mansion Tax in place while adding an additional surcharge tax for sale prices of $2 million or more as part of a new section of the New York Tax Law – §1402-b. The combined 1% base rate and surcharge rates are reflected in the combined NYC Mansion Tax Rates below. PRO TIP: Estimate your Mortgage Recording Tax (MRT) bill as a buyer using Hauseit’s interactive MRT calculator for NYC. The NYS Transfer Tax of 0.4% was unchanged for residential sales below $3 million, however a higher tax rate of 0.65% was implemented for sales of $3 million or more. The new tax rate of 0.65% was also instituted for commercial real estate transactions of $2 million or more. 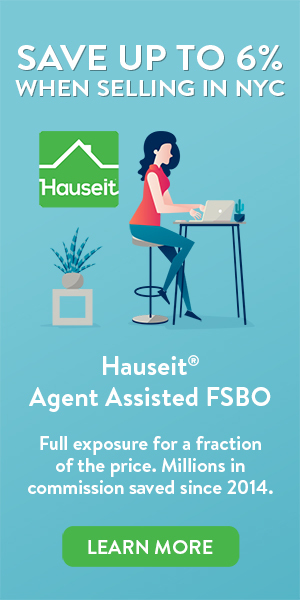 PRO TIP: Estimate your seller flip tax in NYC with Hauseit’s interactive co-op flip tax calculator. 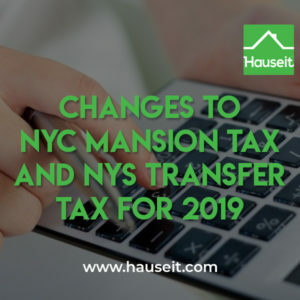 There were no changes to the NYC Transfer Tax Rates as part of the 2019 updates to the New York State Transfer Taxes and the Mansion Tax. The NYC Transfer Tax remains at 1% for sale prices of $500k or less and 1.425% for anything above $500k. The NYC Transfer Tax is payable by sellers in addition to the NYS Transfer Tax.